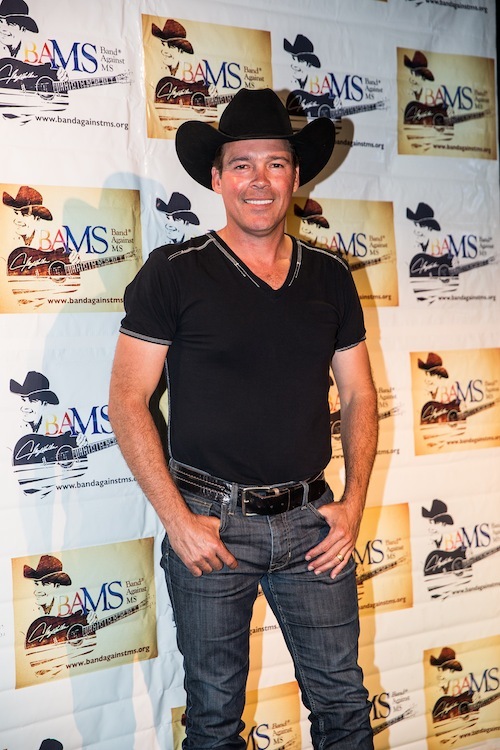 Among the events surrounding CMA Fest is Clay Walker’s annual Chords of Hope Benefit concert, which took place last night, June 10, at 3rd & Lindsley, to raise money for the Vanderbilt MS Center. The CMA festival is a boat-load of fun, but you’ll put in some seriously long hours trying to take it all in. On Wednesday (6/10), I began my day early, at the morning Chris Young fan-club gathering. More than 16 hours later, the post-CMT Awards events could keep you rocking into the night, if you let them. Fan-club celebrations take place at just about every venue in Music City. Copying Carrie Underwood’s event for her faithful followers on Tuesday, Chris brought his fans to the Opry House. “It’ll be hard to top this,” he told the attendees about the location. Chris probably could have filled the place, but he limited the crowd to 500. I’m told that’s how many he can meet and greet in two hours. Really? I’m impressed. Before the party started, we gabbed with Cindy Hunt, Cindy Watts, Jim Catino, proud mama and Music Row businesswoman Becky Harris, George Walker IV, Tori Mason and Chris’s grandpa Richard Yates. Richard was a major influence, since he was a picker and singer who performed on The Louisiana Hayride and palled around with such stars as Marty Robbins. I loved listening to his stories. Chris bantered with his band and chatted easily with the fans as he ran through a set that included a jaw-dropping, a capella rendition of the 1963 Marty Robbins classic “Begging to You.” Thanks to his grandfather, he’s known it all his life. More surprising was a flawless interpretation of the 1962 Tony Bennett pop immortal “I Left My Heart in San Francisco,” performed with simple piano accompaniment. Counterbalancing that was a sublimely country reading of Keith Whitley’s 1988 chart topper “When You Say Nothing At All.” Fear not, Chris also gave the fans “Getting’ You Home,” “Neon,” “Voices,” “Aw Naw,” “Lonely Eyes” and other hits of his own. Next, organizers took fans in groups of 50 to get snapshots and autographs with Chris. Robert K. Oermann told Music Row stories to those remaining in the house to keep them engaged while they waited to meet their idol. As you might expect, Chris’s fan club is dominantly female. During the Q&A session, one woman asked Oermann about radio not playing female artists. It was as if a bomb had been detonated. Suddenly, 400 ladies were loudly speaking out about this: These women are seriously pissed off. I wish every country radio programmer in America had been there. This is a major, major issue with the fans. I was stunned at vehemence of their opinions. They deeply resent radio assuming that they don’t want to hear female voices. I felt thoroughly validated, since I have always thought that to be the case. Sam Hunt, RaeLynn and The Shires performed at the Country Weekly Kick-Off Party Powered by NASH in Nashville Tuesday (June 9) night at the Cannery Ballroom. The sold-out event benefited Musicians On Call. 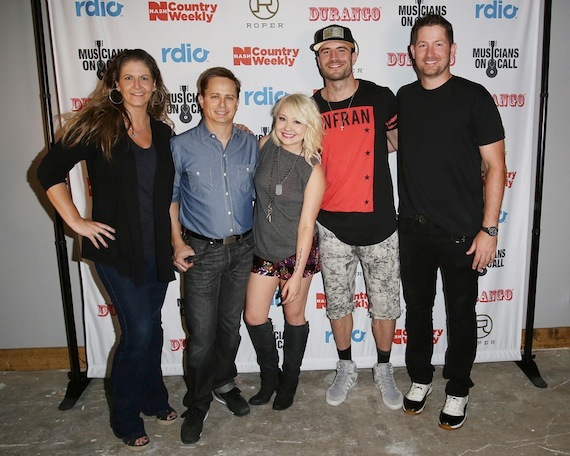 Pictured (L-R): Lisa Konicki (Editor-In-Chief, NASH Country Weekly), Jeff Meltesen (Pubisher, NASH Country Weekly), RaeLynn, Sam Hunt and Pete Griffin (President, Musicians On Call). Meanwhile, at Pinewood Social, the CMA’s Sarah Trahern was conferring with the Metro Nashville police force. Did you know that she also treats the street cops to a big breakfast the week before the fest to thank them for their tireless overtime work during the week? Onward we went. We hit the Riverfront Stage downtown just in time to see and hear Canaan Smith be the inaugural artist of the fest. His hearty and soaring set baptised the stage’s all-afternoon show at 12:30 p.m. The way this series of performances worked is with half-hour sets alternating with 15-minute acoustic segments on a mini-platform in front of the stage. So after Canaan finished, Jason Michelson turned in a soulful, intense set. You have to be a mighty man to take charge of a crowd with just your voice and guitar, and Jason rocked the joint. Next, Parmalee was boistrous and raucous, with audio effects and a party-hearty attitude. “It’s CMA week: Are you guys ready to get this party started? !” exclaimed lead singer Matt Thomas. “Have a good time! When I say, ‘Good,’ you say, ‘Time.’” They did, and this led into the band’s stomping “Musta Had a Good Time” (which incorporated a snippet of Jason Aldean’s “She’s Country”). The band concluded its set with its career-launching “Carolina.” This cleared the way for the clever songwriting of Annie Bosko. “You Look Like I Need a Drink” was a charmer. Again, I so admired these acoustic players who had to amuse and arouse the crowd without being up on the main stage. I took in some of this action during lunch at the George Jones Museum. You see, its restaurant has big open windows that look directly out above the Riverfront stage. I ran into Patrick Clifford and Nancy Jones there, as well as some of the Chris Young fan-club folks. The menu includes healthy salad fare and “normal” food, but I went with a totally-festival diet by ordering the bacon-wrapped hot dog covered in cheese sauce, plus crinkle-cut french fries. For those of you keeping score, this is my second straight day of weenie for lunch. The Riverfront Stage rocked on into the afternoon. Among those booked for the fest’s first big show were Clare Dunn, Logan Mize, Blackjack Billy, Dallas Smith, Sundy Best and Old Dominion. Emily Luxen, Jimmy Carter, Stephanie Langston, Big & Rich, Cowboy Troy, Cole Swindell, Hunter Hayes and The General Jackson showboat glided through. After the CMT Awards at Bridgestone Arena, the Wildhorse Saloon hosted genial Johhny Lee and David Frizzell, at the “A Night With the Legends” concert. Also booked were Eddy Raven, The Oak Ridge Boys, Mickey Gilley, The Bellamy Brothers, Exile, Larry Gatlin, T. Graham Brown, Lee Greenwood, Larry Stewart, Marty Raybon and Tim Rushlow. So don’t come crying to me about not being able to find classic country sounds at this festival. Also surrounding CMA Fest is the Stars For Second Harvest benefit at The Ryman. 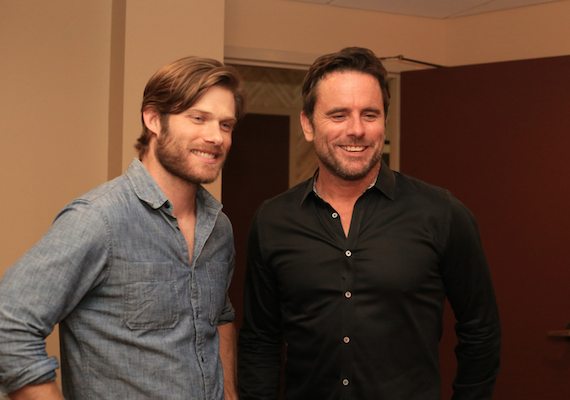 Pictured (L-R): Chris Carmack and Charles Esten at the show on June 9.